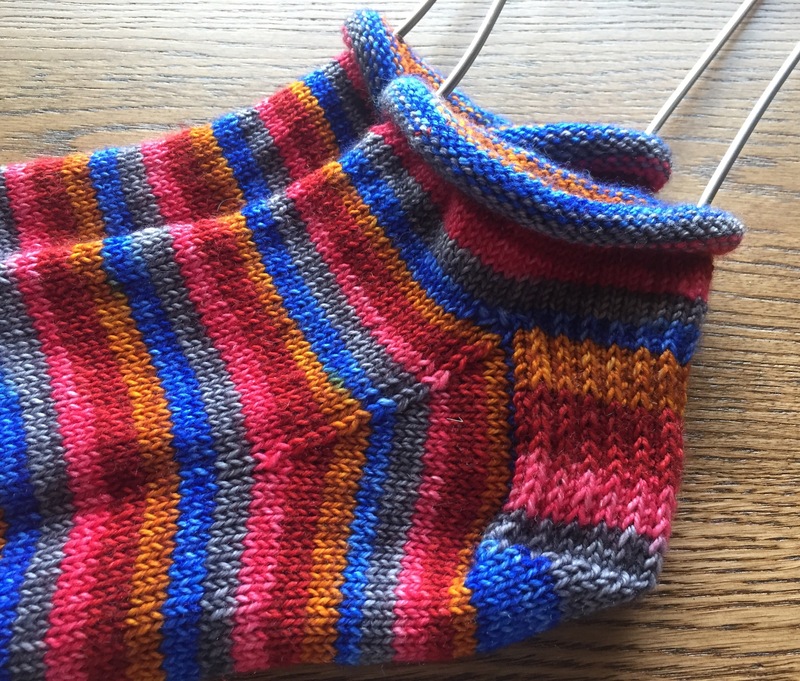 I was totally one of those people who didn’t “get” handknit socks until I started making them. And now I have 3 pairs of commercially made shortie socks and the rest are all handmade. I walk daily and as I’ve gotten older I’ve gotten smarter about not wearing flip-flops when I do. These days, I always wear shoes with good support, so in the summer ‘shorties’ have started to become a necessity and I’ve been working on adding more and more handmade versions to my wardrobe. In my humble opinion, there’s really no better time to knit them than in summer. They are small and portable, they knit up quickly, and you can wear them right away when they are finished. Perfect. With this in mind, last month when I was getting ready to take my kiddos to the new Guardians of the Galaxy movie I cast on a quick pair of Rose City Rollers. I’ve done the pattern before and I know they knit up fast and easy and the fit is great. Because I waited until the last minute to cast-on, the fast and easy part was key. I’m not much of a knitting at the movie theater kind of person and I’m definitely not a casting-on at the movie theater kind of person, so I threw those stitches on the needles just before dashing out the door. I had been planning to knit up some shorties with my Nomadic Yarns Twisty Sport since attempting to cast-on with it earlier this spring. 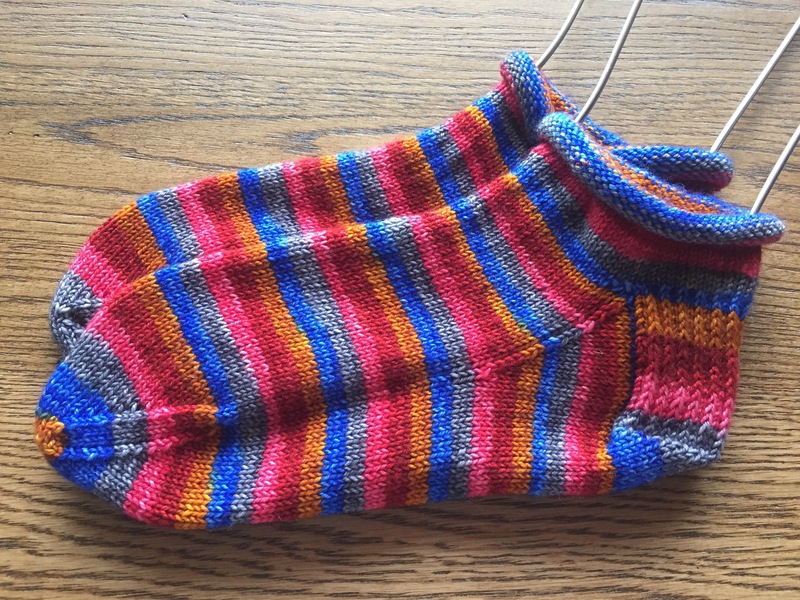 This amazing colorway is named “I’ve Always Wanted to be a Tenenbaum” and I adored it at first sight. I mean, clearly it’s super pretty, really lovely yarn, but I wasn’t a fan of how it performed used as a sport weight — it just knit up too light for me to make socks with it anywhere above a 2.25mm needle. Because this yarn arrives in a 328yard skein and I tend to use between 350-380yards for socks for myself, I was somewhat limited on how I could use it for socks. Rose City Rollers to rescue! As predicted, they were a really fun, quick knit that I took everywhere with me and as per usual they were done lickety split. Clearly I am not one of you. To each his/her own though, right?! I promise no more photos of my imperfectly matched socks. Suffice to say, I love them, imperfectly matched set that they are. They are definitely a bit denser than my other shorties and I’m sure that’s because the yarn is heavier, but they’ll still get the job done. Summer is definitely for shorties and I’m definitely working my way toward having a handknit stash of them. Sooner than later, I’ll be able to say my sock stash is 100% handknit — won’t that be a wonderful day?! I loooove knitting short socks, it’s about as close to instant gratification as a knitter can get! Agreed! I was already through the heel flap by the end of the movie! I think they match close enough!! This is me “twitching”. LOL!!! They are close enough and absolutely adorable. 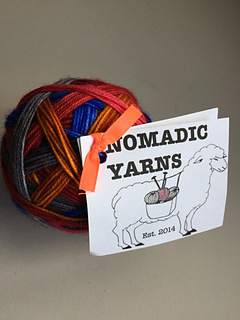 Love the bright colors – perfect usage of that yarn. LOL! I think so, too! If you didn’t tell me they didn’t match, I would not have noticed. And as the toes are in those shoes you so sensibly wear, I think it is OK. I bet Kendra won’t twitch if she can’t see your toes, lol. Sock yarn. I am not kidding that I haven’t a lot of it! I have enough to do my sock a month for the rest of the year, then I recrntly acquired two skeins to keep me going through the winter. 5 skeins is all I have! Whoa. Let’s never discuss my sock yarn stash, mmmkay? lol it’s OK. I have stash, just not sock yarn. I really have been working hard to limit intake to match output, and I was doing well until I learned to spin. Ut-Oh! I really like them for hiking and biking. I will say, getting the right fit is a little trickier, but very worth it! Ad they don’t crawl down inside your shoes? That is what I would worry about. I wear some cotton ones when I have to, and I make sure I get the ones with tight elastic. Well. Occasionally my left one does, but it does with the tight elastic ready to wear ones, too. It’s a long story, but my left foot is just weird. I don’t have the issue with my right foot at all. Yes! I think the key is that you need to get the foot just right — so that it fits, is a little snug, but not too small. If that makes sense. Good fit is key. I would not have thought of them as not matching, but I have heard of those people who have to have exactly matched socks. My children don’t even bat an eye at mismatched socks- they wear them that way on purpose. 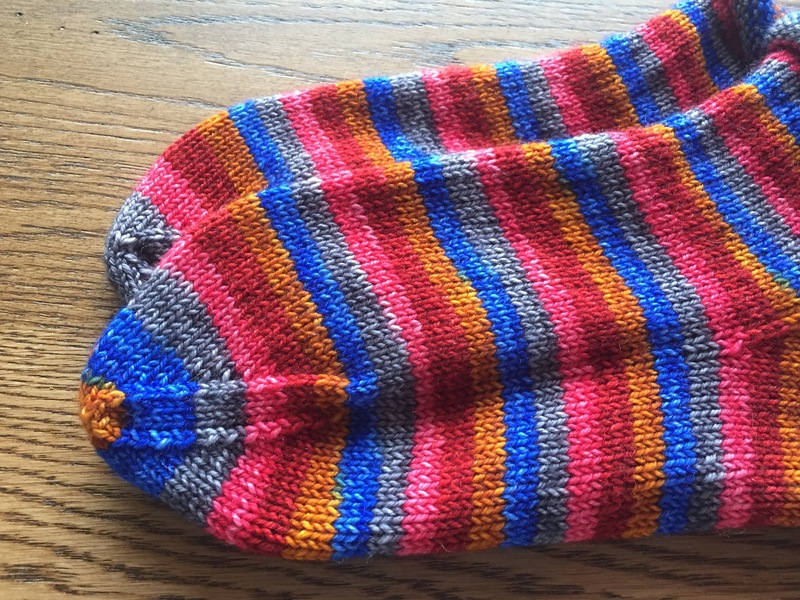 It has been my dream to have only handknit socks for years. My kids are the same way. I try to wear two from the same pair, but I don’t really care about them being identical. At all. LOL! And a little knitting every day can get you a full drawer of handknit socks! Just keep knitting! 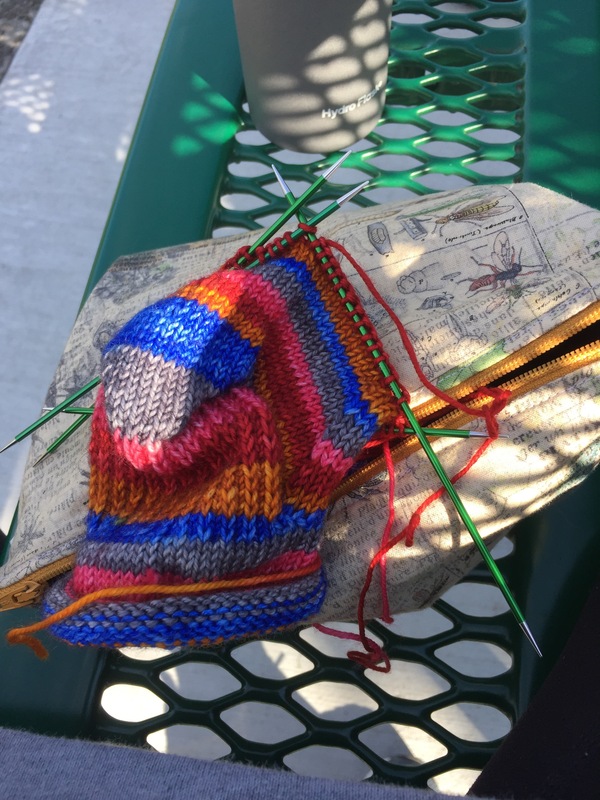 And if you need a group to hang with while you do it, the Friends of Knitting Sarah Group on Ravelry has a ‘Socks with Sarah’ thread that is open to anyone knitting socks — feel free to join us! Love your shorties. How do you like wearing the rolled cuffs. I have yet to make a pair for myself. You know, I thought they wouldn’t be great, but I actually really like them. You’d think that they would not stay up well, but they do!